Belgian winger Eden Hazard couldn’t care less if he is the best player in England, that’s exactly what could give him the distinction soon. This start of the season has been truly incredible for Chelsea star Eden Hazard, who was already coming in fantastic form after the World Cup with his country and continues riding the wave right now. In the last couple of months, there has even been a lot of debate about him being the best player in the world over Messi and Ronaldo, which is complete nonsense as Hazard himself has already stated. 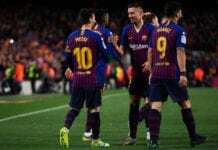 But the devil may care attitude that the player has towards that subject right now, might be the ultimate reason why he truly can dispute the spot as the best with Lionel Messi. Hazard was recently interviewed by SPORT Bible this week about his opinion on who is the best player in England and the world, Eden flat out responded that he doesn’t even care about that and had no problems mentioning other players while completely leaving himself out of the conversation. In the past, we have seen how an obsessed Cristiano Ronaldo was chasing that distinction and how Messi took it away from him repeatedly. Then after he stopped thinking about being the best and started focusing on playing for his teammates, Ronaldo was finally recognized as the best. Hazard has never really been invested in becoming the best player in the world, but this season is shaping him to actually make a good case for the throne. During the interview with SPORT Bible, Hazard spoke about a lot of interesting topics, but the most important was his current form, the best players in the world for him, and finally his incredible goal against Liverpool in the Carabao Cup. “In the Premier League, we have a lot of top players. [Sergio] Aguero is one of the best, [Kevin] De Bruyne is injured but he’s one of the best, Mo Salah was the best last year,” said Hazard about the best players in England. Make sure to vote for him as your @EASPORTS @PremierLeague Player of the Month! About his goal against Liverpool in the Carabao Cup, Eden isn’t convinced that it0s the best he’s ever scored and mentioned a couple more: “It’s [near the] top of the list for sure,” said Hazard. “To be fair I prefer to be on the pitch than the bench but in the team it’s not just one or two players, we have 25 players that can play every week so when I am on the pitch I try to score or change the game,” Hazard concluded. In which position amongst the best players in the world would you place Eden Hazard? Please share your opinion in the comment section down below.